I’ve neglected this blog for like a month now. I started a new job over a month ago and its a 40 minute commute to and fro. So by the time I get home around 5 or 6, I’m tired and just want to unwind, maybe go out with a friend for dinner or just curl up with a good book. Writing at night is isolated to the hours of 9pm or later, when I’m ready for bed. I adore my job and I’m slowly finding the balance between work and still doing other things. Responsibilities, what a concept. Since I’ve been off, I’ve had more time for gaming in the past two weeks and some after school. I was adamantly playing Wario Woods and even got up to level 70. Then I spent around 10-15 hours trying to get to level 75. It’s been filed away for another day and I decided to navigate my way through Final Fantasy II. Around this time last year I picked up and quickly made my way through FF2. I ended up getting stuck in Deist cave and gave up. I made my way through it the other night and now my party is really overpowered. My party all has their HP between 3700-4200 and even the hard bosses are going down within two turns. Final Fantasy 2′s leveling system has gaundered mixed opinions, but personally I love it. I’m over halfway (maybe 3/4ths) of the way through Final Fantasy II and its been a really fun old school RPG. It’s not my favorite game in the RPG (not in the top 5), but its still a solid RPG that should be played if only for its quirky leveling up system. I think the leveling up system in Final Fantasy 2 is actually one of my favorites in any RPG-it took a risk in the early days of RPG’s and it works. I went to a casual play Magic the Gathering night earlier this week. I had built a red and green deck with burn spells on the fly and I was surprised at how well it did. Now I’m working on a slivers deck. 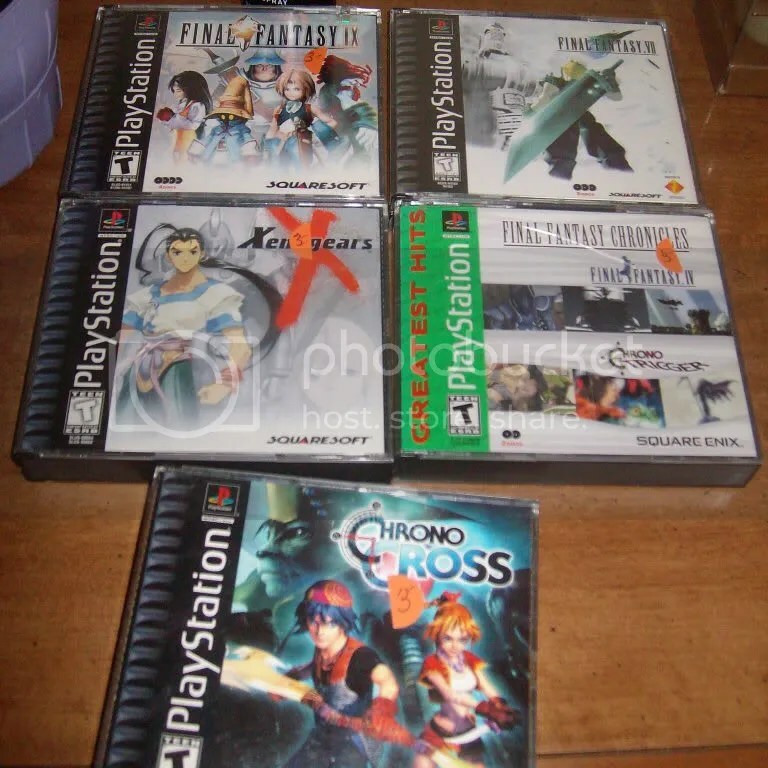 I ran by a local thrift store last weekend and while I was in the book section, happened to look up at the CDs to find Final Fantasy VII. After looking closer, I realized there were several RPG’s! I ended up walking away with the games above for only $15! Oh…right the other part of this blog. Lets see, I exercise regularly, eat lots of fruits and veggies and surprisingly haven’t turned into a peach. Really, I’m eating them way too much if that’s possible. 1. If you haven’t seen the trailer for the new Teenage Mutant Ninja Turtles cartoon you can see it here. The animation is what really throws it off for me. Then again, Nickelodeon is making it and I’ve since lost my faith in them after the early 00’s. 2. While out apartment hunting today, I stopped at a gamestore called G2k. They apparently had just gotten done with a magic tournament so the store was packed. I couldn’t even browse (rude people). I did snag a game I’ve been hunting for for a while now; Warios Woods! I first played it on Animal Crossing and ever since I’ve been trying to track down a copy. It tends to run medium range at $10-15, but I snagged it todays for $5.24. I’m up to level 30 now. Stopping only because my back was killing me. 3. I showed off my nerdiness today at G2k. While I was waiting in line one of the employees was talking about the things the Spider-Man movies featuring Toby McGuire changed. The employee got stuck and said he couldn’t remember the name of Spidey’s first girlfriend. I said “Gwen” and they stopped and stared for a minute and said “Yeah, Gwen”. I felt cool. 5. Speaking of crafts, this is my new favorite website. 8. Etsy makes me glad I don’t have a paypal account. I’d need to buy everything. What’s part of your ‘nerdy’ week or weekend? I have exciting news! After a year of being underemployed and searching for a fulltime job in education….I GOT ONE!!!! 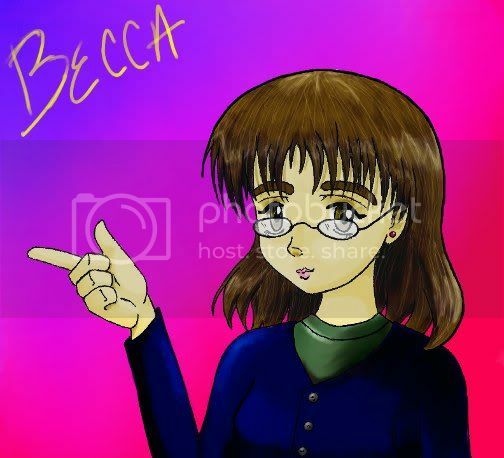 I will be an instructor at a school for children with disabilities starting next Wednesday. It’s a year round school (hence starting next Wednesday), but I do get 1 week off every month or two, plus long vacation time around holidays. Hurray for employment! 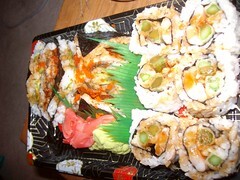 I was starving by the time lunch came around. 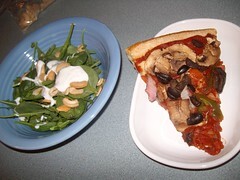 I ate a leftover slice of pizza with a huge Argula and Spinach salad topped with cashews and cucumber dressing. I finished off some more laundry and caught up on ods and ends in-between. It was getting pretty hot around this point, so my water bottle was quickly getting nixed. 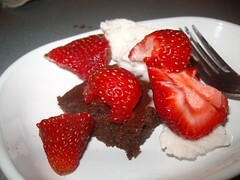 For a snack I had a vegan brownie with a spoonful of coconut milk ice cream and fresh strawberries. 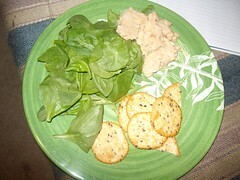 After my snack I ran some errands and indulged in more crafts. 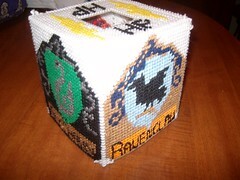 I am a crafting addict and it takes a lot to pull me away from doing them! My evening snack was a much needed bowl of granola. 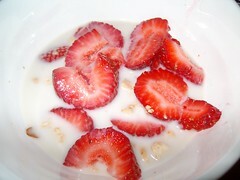 Its been so hot lately that I seem to crave a bowl of granola with diced fruit every night. After snack time I tackled some more crafts and watched Ghostbusters. Favorite movie ever. There are tons of recipes on the internet for 1-minute brownies or cakes and some work, others just turn out terribly. I don’t eat eggs and since most of the recipes call for them, it limits me to what recipe will work. I began experimenting on my own to find a recipe that worked perfectly for individuals with food allergies or vegan diets and came up with a healthy version that can come out to around 100 calories (depending on extras add-ins). 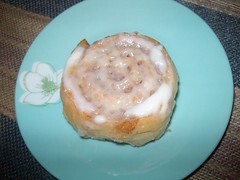 I love having one of these after a stressful day or when I have a chocolate. This easily doubles as well! 1-Mix dry, then wet and put it in a coffee mug. 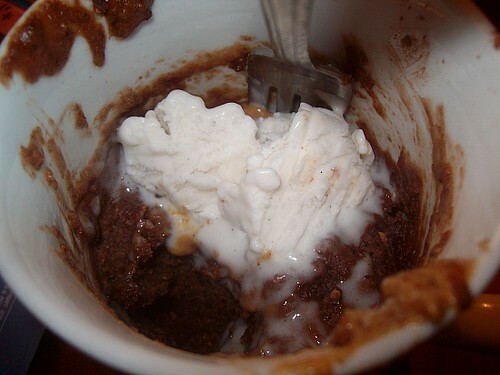 3-Top with peanut butter or ice cream for extra sweetness if desired. On a side note, I completed my third game this year. I beat Endless Ocean last night. I still have treasures, the pirates ship and more fish to find, but for now I’m putting it back on the shelf. It’s a really great game and the perfect pick up and play for a few minutes game. On twitter the other night, a blogger I follow said that she was compling a summer reading list. I’m a huge reader (and studying to be a Library Media Specialist) so it gave me inspiration to create my own list. I have a huge list of books that I want to read and went through picking out the books I’ve been dying to read the most. I have a personal goal to read 30 books this year and these books are sure to be great candidates. The sequel to The Red Pyramid, see my notes below on the third book in the Kanes Chronicles series. I actually checked this book out at one time, but was unable to get to it before it was due. Summers here which means I’ll finally be able to check it out and finish it. I read The Red Pyramid a while back and it was good. I’m not as big of a fan of this series as The Olympian hero books, but it’s a young adult series that I’m happy to follow. This is the third book in the series, so I’ll be reading this one after “The Throne of Fire”. That way I can stop looking so longingly at the bookstore at it. Until another blogger mentioned it recently, I had completely forgotten about “Where We Belong”. 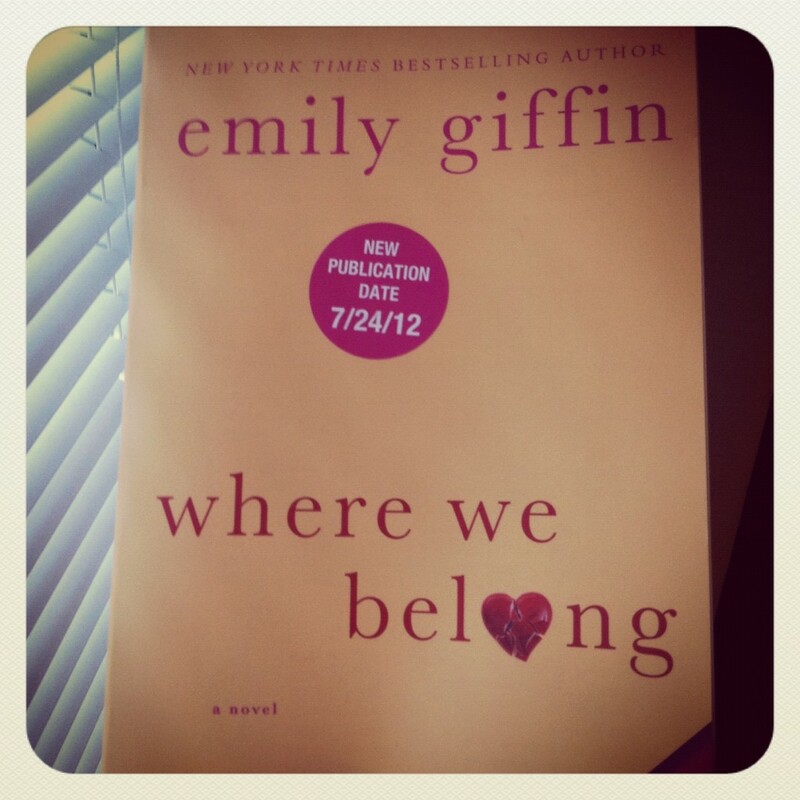 I stumbled across Emily Giffin two years ago nad after finishing “Baby Proof” I quickly read through all of her books. Her plots are straight-forward and easy to digest, meaning they’re incredible light reads. July 24th needs to hurry up! I was an art substitute recently and I have a habit of seeing what books are on a teachers bookshelf for reference when a student says they have nothing to read so I can recommend titles. This teacher didn’t have a lot of books, which is why this one jumped out at me. Reading that the synopsis was about a girl who could potentially get her teacher fired because he was boring/didn’t do anything intrigued me. It’ll be a short read, but seeing who the author is, I have no dobut I won’t love it. I LOVE the Diary of a Wimpy Kid series and the only reason I haven’t read the newest one is because…its always checked out in the library and on a huge waitlist. Luckily, the library is doing inventory now, so I predict sneaking over there in the near future and reaidng it in one sitting. The newest book, The Third Wheel, was recently announced too. I need to buy these books while I’m at it. If you haven’t read this series and have ANY touch of adolscence in you, read it. Asap. I snagged this book after seeing it on the shelf of a teacher I subbed for for a week. I was intrigued with the plot and stalked the library until a kid returned it (I do this a lot. Creeper.) I read it on the beach and while it wasn’t the best fantasy book I’ve read, it certainly had me interested in the next book. It follows Indian culture and there were little things I picked up on from prior knowledge, but most of what I learned was new. It sparked a new interest in India’s culture and I’m anxious not only to read the next book because it’ll be good, but for culture of India 101 part 2. I’m looking for any of the books in this wonderful fact filled, comical British book series. The author has went through several cultures/societies including Aztec, Egyptian and Victorians to give readers a ton of history in a very entertaining way. I’m dying to find more books having read Awful Aztecs. I still remember everything from the books too, so if you know someone who loves history and appreciates history being broken down, you might want to recommend them this series. I can’t say enough about how much I love this series. My mom ordered the fifth book for me for Easter (out of print) and now I’m more than ready to drop the $18 to get the next volume. It’s given me a lot of inspiration for the field I want to go into along with Librarian-working with Special Needs kids. I’ve raved enough about this series. You need to go buy it. I swear, I will read books other than Young Adult fiction this year. I actually first picked up this series when I was in Middle School. I tried tracking down the next few books, but just never got around to it. The second book, Song of the Wanderer, is actually one of my favorite books. Dark Whispers is a book I’ve been wanting to read for years now and would fufill a childhood in a way. Especially since the author has released two other titles in the series. I’ve been out of coffee grounds for the last month, but I’ve had coffee every morning. Why? Because the Sheetz down the road from me is giving away free coffee, soda and slurpees. I go there once a day for a large coffee that will last me all day. I went out this morning, filled my tank and grabbed a large coffee. 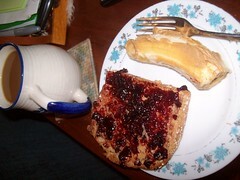 I came back and had a banana with almond butter (Justins!) with my last blueberry bliss bar. During breakfast I got an interview call. 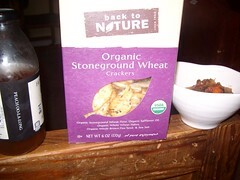 Homemade Vegetarian chili with stoneground crackers and half an apple. I’m going to be sad when I’m out of chili, but its lasted a week with daily consumption. 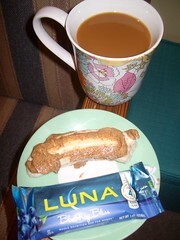 Unpictured chocolate covered espresso beans for an afternoon boost! I ended up getting a second job interview too. Wow, four in the last week! Too bad only one was a school related job I applied for. 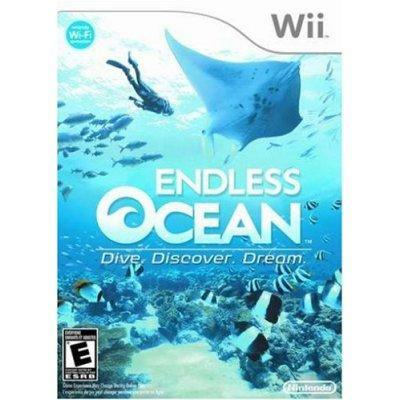 Endless ocean is a title I picked up a while ago. I had stopped by gamestop on my way to babysit when I noticed someone had already bought and returned a copy (released January 2008, this was February 2008). I snatched the copy and the guy checking me out said it was a good game, but slow-paced. I popped it in later for an hour or so, but once I got busier with university, I had little time to play. It wasn’t until recently that I’ve had a few afternoons to pop it in after work and before meetings/volunteering and now I’m having trouble not playing it for 20-30 minutes a day. Twenty to thirty minutes is the ideal time-frame to play Endless ocean. It’s pretty laid back and the missions tend to be fairly short. You have the option to move to different locations using the steering wheel in the cabin, but its good to go at a slow pace, especially if you want to see all the sea creatures in the game. 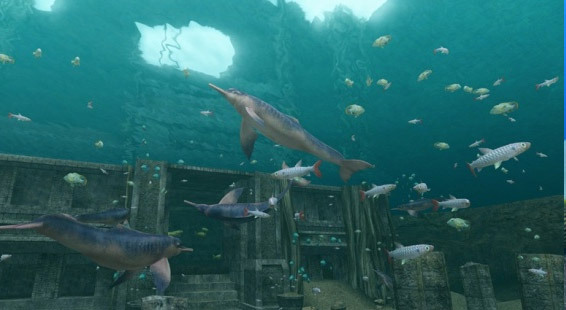 There’s a notebook players can keep track of fish in, a camera and interesting areas to explore. I’ve explored caverns and an abyss so far. There are also guided missions and new things that crop up as players move throughout the game which keeps the game refreshing and relaxing. Its a great experience so far and I’m only about halfway through. I’m excited to see what new things crop up as I explore! No, you don’t want to run into this guy! +Shenandoah song, in the cave. I grew up in the Shenandoah Valley…I never liked this song and it appears in this game!! I went from disliking it, to thinking its pretty, to wanting to not hear it again in 15 minutes. +Things to do-missions, achievements in finding things and new places to explore keep the game interesting, but 20-30 minutes is my interest level, no matter how much I love it.